This is a favorite among the puffers, probably because the Dog-faced Puffer or Black-spotted Puffer looks like such a nice guy, look at that face! The Dog-faced Puffer or Black-spotted Puffer are often exported from asia as juveniles. They make a special pet that can recognize their care givers and become visibly excited when given attention. Make sure you have a fairly large aquarium if you plan on growing this one up, it can reach up to 16" (40 cm)! This Dog-Faced Puffer is the epitome of "adorable," which is a term not often used with fish! They have an endearing face and act like dogs! They do need to be dewormed, tend to chew on cords and airlines, and like to spit water out of the tank to get your attention! These little puppies grow to just over 1 foot and need a 150 gallon tank. Dog-Faced Puffers also come in various colors such as black, yellow or orange! They are not recommended in a reef tank, however benefit from hard shelled crustaceans like hermit crabs to eat and help wear down their constantly growing teeth. Prone to Crypt, keep the tank at 82˚F to help keep this parasite from taking hold. They can be housed with other pufferfish that are not more aggressive than they are. Use a container to transfer it, not a net. The yellow version of the Dog-Faced Puffer is not the easiest color morph to find! They have the same great personality as other large puffers and need a 150 gallon tank with lots of hard shelled prey to keep their "beak" or fused teeth from growing too long. They are a joy to keep and can be kept with other pufferfish that have the same or more mild temperament. Instructions on how to trim their teeth! As seen in the additional comments, this beloved puffer is doing well after his procedure. They need to be sedated with 3 drops of clove oil per liter of water and behavior needs to be observed. This is the only time it had to be done in the 4 years she has owned her puffer and states that he is doing a better job of keeping his own teeth ground down these days! This is one of the other rarer black color morphs of the Dog-Faced Puffer, Arothron nigropunctatus. The species name makes one wonder if the first one found was black from the latin root work nigro for black. No matter what color they come in, they are, well, cute fish! They have personalities like dogs and in many ways can be as challenging as dogs! Keep cords and airlines out of bite range, and cover your heaters to prevent them from biting and breaking it out of curiosity. Provide hard shelled prey to keep their teeth worn down, because having to trim them is not a walk in the park..... thats what you do with a real dog! Maintenance difficulty: Although the Dog-faced Puffer or Black-spotted Puffer is easy to feed and generally hardy, they require special care and a special diet to stay healthy. Puffers have strong teeth that grow throughout their lives. They need to be offered hard shelled live food often to keep their teeth worn down. For a better explanation and links to the practice of puffer dentistry (if needed) please read here. Because they eat a meaty diet and are often messy eaters, puffers will produce a large bio load on the biological filter of your aquarium requiring frequent water changes and good maintenance practices. 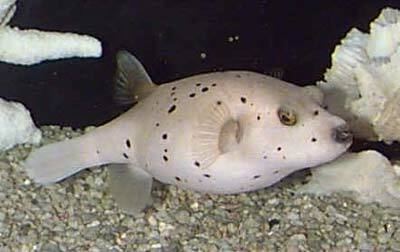 Habitat: Natural geographic location: Dog-faced Puffer or Black-spotted Puffer are found in the Indo-Pacific. Islands of Micronesia and Samoa to East Africa. This is a species found on or near coral reefs. Social Behaviors: Generally this fish is not aggressive. Just make sure he doesn't think any other fish are meant to be dinner. Length/Diameter of fish: Dog-faced Puffer or Black-spotted Puffer adults can grow to 40.0 cm (16 inches). I love the dogface puffers. I had one but my tank got poisoned so it died. I had a rare gold one. I HAVE A 55 GALLON TANK. I HAVE A GREEN WOLF EEL, TANGS, A FAIRY WRASSE, A HARLAQUIN SWEETLIPS, AND A NEW DOG FACE PUFFER. Do you like animals? I do they are so much fun. A 55 gallon is way to small for a dog face puffer. I just bought a yellow bellied dog faced puffer. It is very active at night, but during the day it just lays under a rock until feeding time. It has a healthy appetite. Is this normal? Very normal Brendan! They can be a bit shy when intoduced into a new tank. I use to hand feed mine krill with tongs to get them comfortable. Once comfortable they have amazing clownish personalities. It's normal, these guys seem to be nocturnal, least mine and obviously yours are. I was getting worried with my days old Dog Faced Puffer chilling on the bottom as well. However have noticed he is very very active at night when the lights are out. Sometimes I'd wake up 4am, room in complete darkness only to turn the light on and there he is wide awake swimming around. During day cycle he does become active just enough to get his daily meals, then he chills out again. Obviously burns all those day calories at night, hah. Please help me with infomation on these things. My 'Arothron nigropunctatus' was spawning. She lives alone in a water tank. Female of 'Arothron nigropunctatus' was dying after spawning? Please tell me who knows these things?